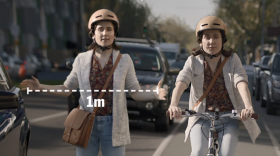 The Amy Gillett Foundation partnered with Monash University to conduct a world-first study of the distances drivers give cyclists when passing on Victorian roads. Research published in the scientific journal Accident Analysis and Prevention today (Thursday 11 April 2019) shows cyclists are frequently passed at close and unsafe distances. 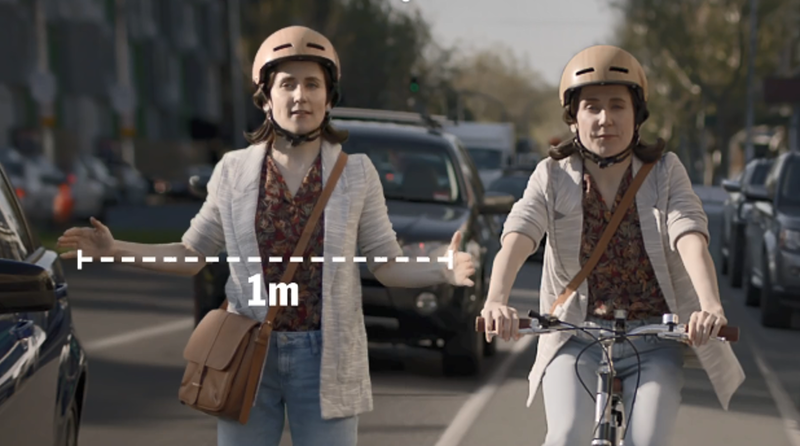 In one in every 17 times a driver passes a cyclist, the gap was closer than one metre. Alarmingly, in higher speed zones greater than 60km/h, one in three passing events were too close. The study collected data on 60 cyclists in Melbourne who rode their bicycles with a device installed to quantify the distances that motor vehicles drivers provided them. The cyclists in this study recorded 422 trips including over 18,500 vehicle passing events. “We know that vehicles driving closely to cyclists increases how unsafe people feel when riding bikes and acts as a strong barrier to increasing cycling participation”, said Dr Ben Beck, study lead author, Monash University. The Amy Gillett Foundation has campaigned for Minimum Passing Distance legislation across Australia. Victorian is the only State without Minimum Passing Distance legislation. Already in place nationally, the amendment adds to the current road rule and specifies that when passing a cyclist that drivers allow a minimum of one metre in speed zones up to 60km/h and 1.5 metres in speed zones over 60km/h. Currently, Victorian road rules require drivers to leave a ‘sufficient’ distance when passing cyclists but fail to provide any guidance on what is ‘sufficient’. “Drivers, cyclists and everyone using Victorian roads will benefit from making the law clearer and bringing Victorian into line with every other Australian state and territory”, said Andy Sheats, Amy Gillett Foundation Chairman. “Passing distance legislation already exists in Victoria. What we are seeking is to clarify the existing laws. We need to educate people about sharing the roads safely. In other parts of Australia, changing the law has been a key part in this education,” said Mr Sheats. In 2016, a Victorian bipartisan Parliamentary committee recommended implementation of Minimum Passing Distance legislation in Victoria. However, an education program has been conducted by the TAC in lieu of legislative change. The study also found that marked on-road bicycle lanes and parked cars reduced the distance that motorists provide when passing cyclists. Specifically, passing events that occurred on a road with a bicycle lane and a parked car had an average passing distance that was 40 cm less than a road without a bicycle lane or a parked car. The Amy Gillett Foundation strongly supports the study authors recommendations for greater action to review and update cycling infrastructure to create a safe cycling environment in Australia. “What this research shows is that we need smart, thoughtful and engaged approaches to cycling safety. We need improvements across legislation, education and infrastructure to ensure Victorians feel safe to ride. This isn’t about pitting one group of roads users against another, it’s about understanding that everyone wants to get home safely, and it’s about coming together to find ways to improve our road system so that it works for everyone,” said Mr Sheats. This study was independently analysed and is the largest of its kind in the world. The Amy Gillett Foundation is proud to support innovative research into cycling safety which provides evidence-based approaches to keep cyclists safe across Australia.